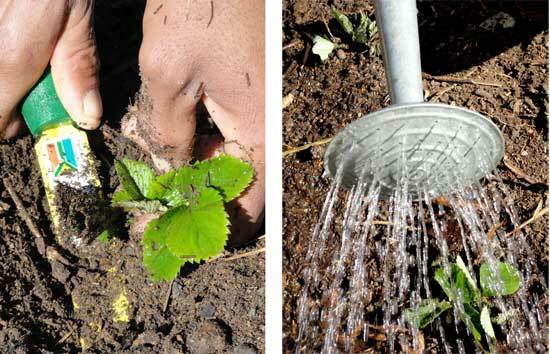 May is the month for planting strawberries in our garden, but I am told that any time from mid-March is good for “Selecta” the strawberry variety that is easy to grow in the Cape. We finished planting this week, just in time for the winter rains to settle them in nicely. The area we selected for the strawberries is a long bed in full sun next to the berry block where the other berries – raspberries, blackberries, English gooseberries and red currents grow in semi-shade. Preparing the ground: We prepared the ground by digging it over about a spade depth. We added plenty of our best, well-decomposed compost we made earlier the summer, to get a rich growing medium. 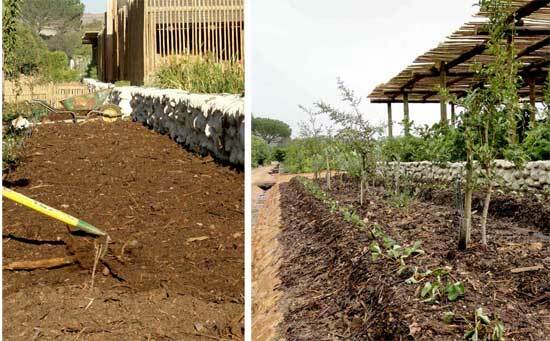 To ensure good drainage we raised the ground and made 2 low mounds about 15cm high and 30cm wide with a narrow footpath in the middle for easy access to each plant. Selecting new plants and lifting runners: Last year’s plants multiplied by hundreds and thousands, spreading with tendrils that rooted where they touched the ground. We simply had to lift and divide. The mother plants with old dark roots were thrown out and only the young plantlets with vigorous, white roots kept. As we lifted, the healthy young plants were cleaned by removing any old leaves and placed in a bucket of water to prevent them from drying out before planting. care with regular watering making sure the plants do not dry out. Luckily the rain has arrived as predicted and I hope growing strawberries will be as easy as this until we start picking the first fruits in spring. Hi Linda, strawberries are usually grown from little plants emerging from the mother plants with long stems called ‘runners’. Remove them from the mother plant in winter. 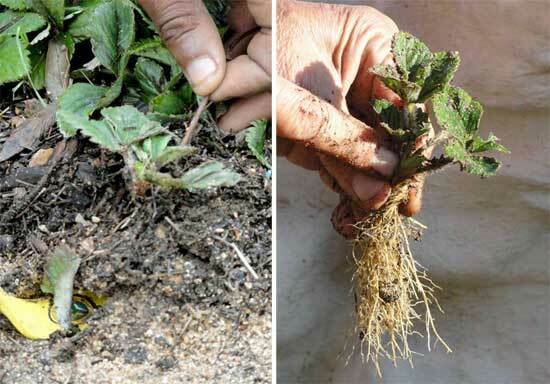 If you would like to try and grow strawberries from seed – go ahead and remove the seed from the outer side of the fruit and plant as soon as ripe or in Autumn… they should give a little root soon!